America's funding needs are starting to grow at a dangerous pace. Even before the NYT reported of Trump's startling suggestion of a further $100 billion tax cut in the form of an inflation-adjusted capital gains tax cost basis which mostly benefits the wealthy, earlier today the U.S. Treasury said it expects to borrow $56 billion more during the third quarter than previously estimated, while market participants expect shorter-dated Treasuries to absorb the brunt of the new supply as the Trump administration grapples with a mushrooming budget deficit. In the Treasury's latest quarterly Sources and Uses table, it revealed that it expects to issue $329 billion in net marketable debt from July through September, and $56 billion more than the $273 billion estimated three months ago, in April. assuming an end-of-September cash balance of $350 billion, matching its previous estimate. It also forecast $440 billion of borrowing in the final three months of the year, with a $390 billion cash balance on December 31. The borrowing estimate for the third quarter is the highest since the same period in 2010 and the fourth largest on record for the July-September quarter, according to Reuters. In the second quarter, net borrowing totaled $72 billion, slightly below the earlier prediction of $75 billion. The US fiscal picture continues to darken as a result of rising social security costs, military spending and debt service expenses while corporate tax income is declining after last year’s tax reforms. As a result, the federal budget deficit is expected to reach $833 billion this year, up from $666 billion in the budget year ended last September, a number that is well below the net funding demands for the US Treasury. The new projections put total net borrowing at $769 billion for the second half of 2018 and a whopping $1.33 trillion for the whole year. The federal budget deficit totaled $607 billion through the first nine months of the fiscal year that ends Sept. 30, up 16% compared with $523 billion from the same period a year earlier. In late June, the CBO forecast that total government spending would exceed revenue by $1 trillion in 2020. That would suggest that the net financing need of the US in two years could be as high as $1.5 trillion. Yields on 10-year Treasurys rose to session highs of almost 2.98% following the release of the borrowing outlook according to Bloomberg data, although the bulk of today's move was in anticipation of a surprise announcement by the BOJ. Meanwhile, the 2-year yield was steady around 2.67%, near the lows for the day. “Because of surprising declines in corporate tax revenues, the federal deficit is constantly under discussion this month,” FTN rates strategist Jim Vogel told Reuters. Adding to the supply of bonds hitting the market, the Fed is also trimming its vast holdings of Treasury debt as part of Quantitative Tightening, with some $40BN in monthly reductions in the third quarter. On Wednesday, as part of its quarterly refunding announcement, the Treasury will detail how it expects to spread the new supply across bond maturities ranging from one month to 30 years. As we discussed over the weekend, bond analysts expect faster increases in maturities out to five years, which could push their yields up at a quicker pace than those for longer-dated securities, resulting in further flattening of the yield curve. According to Reuters, the Treasury is expected to increase sales of 2 and 3 Year notes by $1 billion a month, similar to its increases in the second quarter. Securities maturing in 7 to 30 years should increase at a rate of $1 billion per quarter, resulting in ever increasing supply to fund Trump's fiscal program. Some estimate that five-year note sales could also ramp up by $1 billion more per month compared with the same amount for the whole of the second quarter. While one outcome of emphasizing short-dated supply will be further bond flattening, short- and intermediate-dated debt is seen as having strong demand and relatively attractive rates. Avoiding a similar sharp boost in supply of long-term rates avoids a large increases in yields that could create an economic drag. 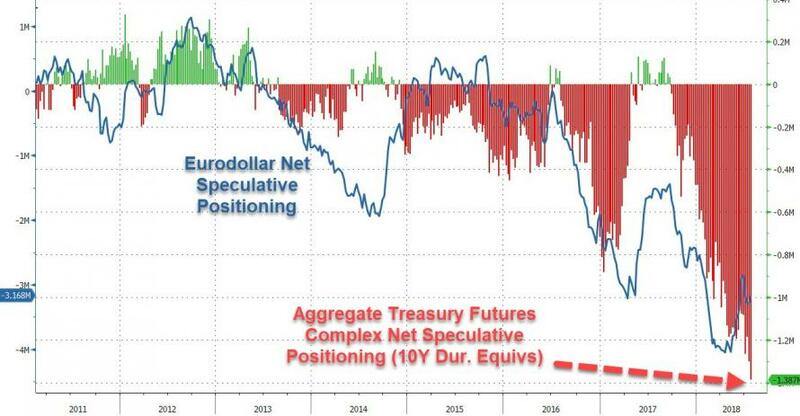 The market, however, is bearish on all Treasuries across the curve and as we showed over the weekend, the latest CFTC data showed that speculators last week have put on record aggregate Treasury short positions in five-year, 10-year and 30-year Treasuries futures, while also expanded to their short two-year note position. Finally, investors will be looking for clues when the Treasury plans to introduce new two-month bills and five-year Treasury inflation-protected securities, as both have been discussed recently by the Treasury Borrowing Advisory Committee, even if many don't see these as being introduced this quarter.